I have not made anything for the blog in the last week and a half-and I feel awful about it. Buuut...wedding planning is crazy time consuming. And it's go-time on Saturday. SO I brought in one final guest poster to help me out-the amazing Liz of That Skinny Chick Can Bake!! You may remember Liz from when she posted for me last year when I moved. Obviously-she's an amazing friend and she bakes DELICIOUS treats! And without further ado, here's another one of those goodies! Hi, Cooking Actress fans! I'm Liz from That Skinny Chick Can Bake, and I'm honored to be pinch hitting for Kayle. I have a feeling that baking cookies had to take a back burner when the countdown to the big day reached single digits. Kayle will be a Mrs. in just a few days! Since weddings are all about family and friends, I thought I'd share some cookies I made especially for my youngest sister. I have three sisters and we're all foodies, but Maddy rarely makes desserts. 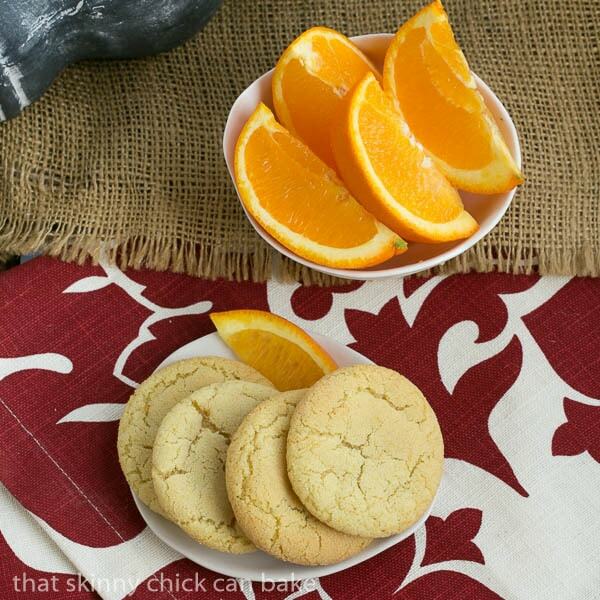 I did spy some grocery store orange crinkles on her counter top on one of my recent visits to Denver. Figuring they were laden with shortening and artificial flavors, I wanted to whip up some of these gems from scratch. 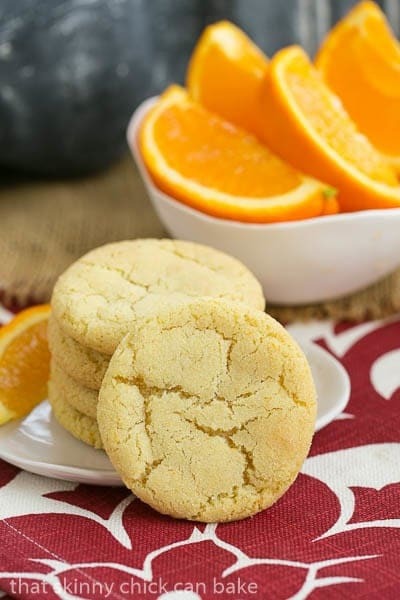 Though Maddy had purchased a relatively tasty store bought version, I had the urge to deliver a batch of homemade orange cookies on my next visit. 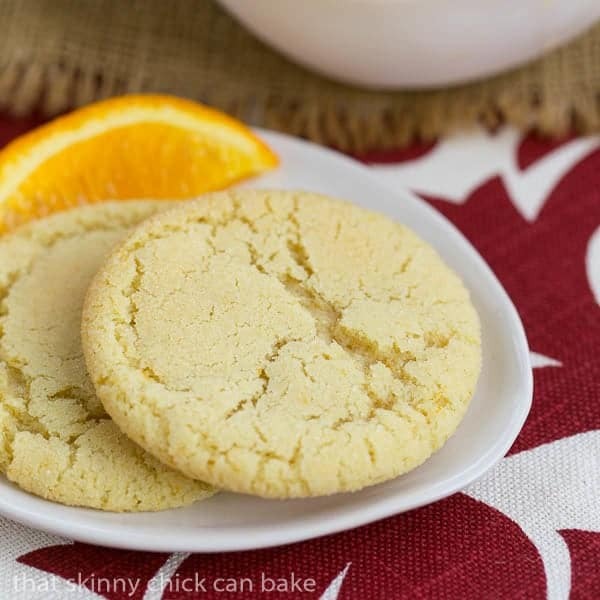 I located loads of lemon crinkle recipes, but the orange variety was scarce. I just combined and tweaked a few of the former, adding orange zest and orange extract to amp up the citrus flavor. Make sure to take the extra time to massage the orange zest into the sugar to release the essential oils--a trick I learned from Dorie Greenspan. The results were terrific. I hope you'll give them a try! Preheat oven to 350º. Line baking sheets with parchment paper. Set aside. In a medium bowl, whisk together flour, baking soda and salt. Set aside. In a larger bowl, mix together sugar and orange zest. Using fingers massage the zest into the sugar to release the essential oils. Add butter and beat with hand mixer till light and fluffy, about 4 minutes. Reduce mixer speed and mix in eggs and extracts. Scrape down sides of bowl, then slowly mix in flour mixture just till combined. Scoop out about 1 1/2 tablespoons of dough and roll into balls. Roll dough balls in sugar and place on baking sheet, about 2 inches apart. Bake for 10-13 minutes or until cookies look crackled and bottoms slightly browned. Cool on baking sheet for a few minutes before removing to cooling rack to finish cooling. Awww thanks so much Liz!! Follow That Skinny Chick Can Bake alll over the social media!